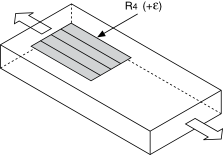 The following figure shows how to position a strain gage resistor in an axial configuration for the quarter-bridge type I. 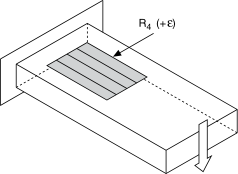 The following figure shows how to position a strain gage resistor in a bending configuration for the quarter-bridge type I. A single active strain gage element mounted in the principle direction of axial or bending strain. The following equation converts voltage ratios to strain units for quarter-bridge configurations. where Vr is the voltage ratio that virtual channels use in the voltage-to-strain conversion equation, GF is the gage factor, RL is the lead resistance, and Rg is the nominal gage resistance.